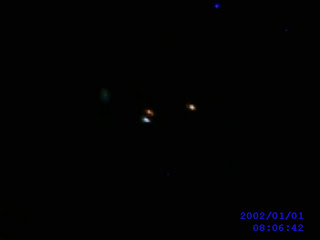 Last night, February 20, 2009 there appeared to be the same bright light off the west coast of Prince Rupert, B.C. I first noticed it on Sunday eve passed. I thought it was a bit bright and strange. But last night it does the same thing as the other nights. It goes really bright and then it fades. I was discussing this with my husband who is a fisherman and he said they saw the same light out fishing the other night. But this light had moved when they were fishing and it hovered down low then took off. We believe it is the same light, because it is in the same spot as before. We are not sure what it is, but it is definitely not normal. We live right on the harbor side of Prince Rupert and it is very bright at times. Well not sure what it is, but it is not a normal star. Maybe it's a UFO. Thanks for your interest. this is a photo that was taken on a landscape photo session that my sister does quite often. She does not know what to make of it but it does present some intriguing ? This was taken from Chathamkent in southwestern Ontario. I've never seen something like this before except on TV and the internet, it may be nothing but then again we can't figure it out. It was taken on February 15 2009. Hi Brian, My sister was simply driving and taking photos, not really paying any attention. She discovered it when she viewed her pictures afterwards. Nothing in any other frames before or after the photo was taken. She takes hundreds of pictures. I guess sooner or later something would show up kind of unexplainable. She said post it no problem. Thank you to the person for sending in the report and thanks to his sister for allowing me to post the photo. Location of Sighting: Alliston, ON.Number of witnesses: 1Number of Objects: 1 Shape of Objects: Round. Location of Sighting: Woodbridge, Ontario.Number of witnesses: 4Number of Objects: 3Shape of Objects: Round? Location of Sighting: Whitby Ontario Canada west sky. Full Description of Event/Sighting: I noticed a very bright star in the western sky last night around 7:00pm. The sky was clear and the object seemed to actually cast a very wide beam. After looking at the light for a while, I thought that perhaps it was a helicopter with a search light on. My daughter joined me and the light didn't move for a further 20 minutes. 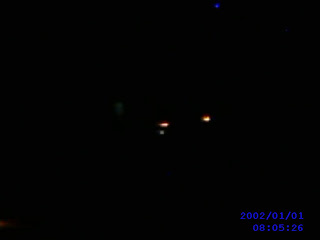 We then looked at it through binoculars and could both see a leading, very bright light like a huge fire or search light. The remainder of the overall triangular shape seemed to consist of either a number of smaller triangles or flame streaks of blue and orange. The object seemed to maintain position and configuration for the duration of our observations. We stopped checking around 11:00pm. We took a photo of the light at around 9:00pm, but it just looks like a bright light in a dark sky. I was just outside tonight and noticed that this light phenomenon is no longer in the sky. Have you hear any other like reports? Was there a comet in the sky last night? Wondering what we saw. Location of Sighting: Kincardine, Ontario.Number of witnesses: 1Number of Objects: 1Shape of Objects: Round. Full Description of Event/Sighting: Round (oblong) bright white light no sound and very fast. There was no smoke trail no jet sounds. It flew just under through fog among clean horizon. I couldn't see it go anywhere and lasted a slit second. I decided to report it as earlier that summer. I saw a light hover in my trees darting back and forth and thought it might be a firefly as it was small. There isn't any fireflies out this winter so I wanted to confirm I saw this light when I was out for a smoke. Brian Reinhardt could see it from the Richmond side of the tunnel. It was a large rectangle with a yellowish tinge, hanging in the air to the north around 6 p.m. on a sunny evening. He was riding a motorcycle and lifted his visor. It must be a reflection, he thought. It wasn't, his girlfriend saw it too. By the time he got to the south end of the Oak Street Bridge, he saw what appeared to be shadows of people moving about inside—but its massive door was closing. 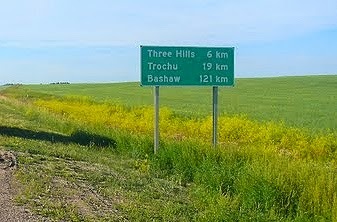 Location of Sighting: Chase, B.C. Shape of Objects: Round ball of fire. Full Description of Event/Sighting: A ball of fire shot across the sky in front of my as I was walking down Shuswap Avenue in Chase, B.C. I was walking from west to east and the ball crossed my path going from south to north. It was beautiful. It was crossing through a blue break in the clouds and it was a bluish colour in the centre and very bright. It disappeared over the mountains above Star (Aylmer) Lake. Location of Sighting: Glencoe, Nova Scotia, Canada. 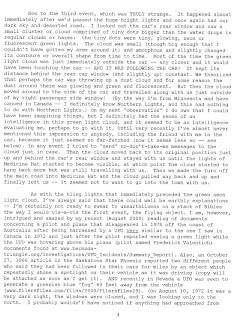 Full Description of Event/Sighting: I never knew exactly what this was and this would be the first time I'm reporting this, but thought that someone might be interested in this, especially since lately UFO sightings have increased by so much. This was a few years ago and hence I don't remember all the detail, however this is my story. I was by myself, on the way home from visiting who is now my ex girlfriend. It was a clear winter night and we lived out in a very rural area with no street lights, houses, etc. As I drove around the last few turns before emerging from the wooded windy road, I noticed a very bright blue object in my rear view mirror that was traveling in my general direction. The object passed over head me and as it did, it lit up the area around me in the same bright blue light. As it passed me and disappeared behind the tops of trees, suddenly I could see a very bright blue flash from wherever the object was and then dark, only my cars headlights to illuminate the snow covered road once again. As I came home about 5 mins later, I told this to my mother who then says that she seen the same thing, but she seen the object travel north bound which is the exact opposite of where I seen it go. Mind you, this could of been a meteor with debris falling off it and then crashing into ground, hence the flash, but I don't know. And I'm one who believes in UFO's and aliens existence. Either way, someday I'd like to know what it really was. Date: September 2, 2008 Time: 5:30 a.m. and 10:30 p.m. Location of Sighting: Woodstock, ON. Number of witnesses: 9 Number of objects: 2 Shape of objects: Triangle. Full Description of event/sighting: I was up early letting our dogs out. I was waiting for them to return when in the south of our property something caught my eye. It was (what I initially thought) was a very bright star. When I looked again, I noticed the "star" was flashing very bright lights of green, white, red and mauve. I was very taken back by the vibrant colours it was flashing and immediately thought it was a plane. But I realized it couldn't be. It was staying still over our barn roof very distant, but close. After watching it for 15 mins. I started to second guess myself, as this really seemed bizarre to me. I then asked my 18 year old daughter to get out of bed to have a look. I didn't tell her why or what I just pointed out to her to look at the star above the barn. She looked in a half awakened state and said, "Ya, what about it." Then she started to wake up and shouted, "Wow, what is that?" I said, "I didn't know but to go get her telescope out and wake up the other kids." My other three came down to look in a half awakened state. Their ages are 17,15 and 14. They all saw the same thing I did. I then called my husband who was on his way to work. I asked him to stop his vehicle and look back in the direction of our barn. He couldn't see anything and I think at the time, he thought we were a bit crazy. 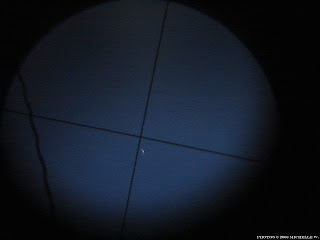 We focused the telescope on the object and could see in a very distinct line lights of red, green, white and mauve. We tried to take pictures of it with our digital camera but didn't seem to have any luck because of the darkness of the sky. We were all so shocked and I wanted someone else to see what we were seeing I called my mother who lives about 10 kms. away to the south. I asked her to look outside to see if she could see it. She couldn't from her house. I told her to get in her car and come over because I wanted someone else to see what we were seeing. I told her to hurry because dawn was coming and she would miss it. That was at 6:00 a.m. this morning. I also made a phone call to our friends who lives in town about 5 kms. away. I woke them up as well and asked them to look. Pleading that I wanted someone else to witness it. They too, couldn't see what we saw. However, my friend, jumped in her car and was driving on the outskirt of town. She told me then she couldn't really see anything. By this time, my mother had arrived at our house, it was then about 6:10-6:15 a.m. I told her to hurry before the sun was on it. She looked through the telescope and could see the lights flashing in a row. At the same time, my oldest daughter was climbing on top of our van and randomly taking pictures. Again, thinking we were not getting anything of validation. Upon coming inside, we started to go through our pictures and could actually see little lights in the sky against the early dawn. Then we started to zoom in on the pictures and what we saw sent shivers up our spines. We have many pictures of lights in the form of triangles and lines with the coloured lights. We want to show someone these. We have never experienced anything like this and are very confused as to what we think they may be and what our logical/rational mind think they should be. As dawn approached all the other stars in the sky disappeared but the lights hovering above our barn. It all ended by 6:30 a.m. We just noticed after we left for a brief minute, it was gone. Later, in the morning I went to show my friend Joyce, our "proof" we were not making it up. She confirmed again she couldn't see anything our way on her drive, except one star in the distant. I asked her if she noticed any other stars out, as that was something we DID notice. She said, "No, there wasn't any. Just that one star." I told her I believed it to be our sighting. I then went to my best friends' Lisa house with a bit of hesitation to ask her opinion as to what my pictures looked like to her. She couldn't explain them either but agreed it was weird. She wanted to come down tonight to see if we could see any. As night approached , we started to look over the barn. There wasn't anything. Not a star in sight. As it became darker though, we started looking around the sky more. Off to the west we saw the same flashing "star." But this time it wasn't as close or as bright. We called my friend Lisa over. She came over and looked in the telescope that we had brought out again and witnessed what we were all seeing. My husband came up from the barn and too, witnessed the same thing. But it seemed farther away. So, the kids and myself with Lisa all took a drive out farther to the country where there wasn't false lighting. On a very dark road we watched for approximately an hour and saw two flashing objects in the sky. One to the west and one to the south west. We all agree we could see the flashing lights of red, green and white and they hovered. We actually saw the objects move slowly left to right and in a half circular motion at times, but always remain in approximately the same location. We also observed when we saw the airplanes would be flying closely by the object they distinctively moved left to right and then back again but always maintaining the same location. After awhile we drove home. None of us really knowing what to think and really what to believe. We all know what we saw. We all know what the pictures show but we really are looking for logic and rationale...but can't seem to come up with any. None of us were disbeliever, but none of us could say we were believers. Even with what we have all witnessed, we still are confused. I have the pictures on our memory stick and I have not taken them off. I don't want anyone to disprove our authenticity of our picture. They are genuine and unexplained. Please email us if you would like to see them. Maybe you can explain to us what we can't explain, even when we ALL have seen what we have. Thank you to the witness for their report, also I have requested to have a look at the witnesses photos. 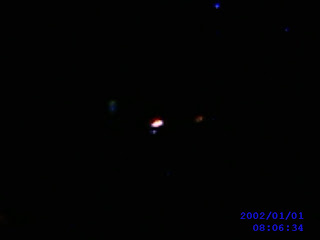 The Photos are © 2008 Michelle W.
Eyewitness Account: I was on our patio last night around 6:30pm and this very large bright light in the sky was hovering. 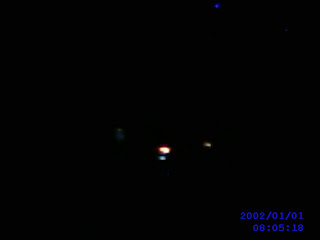 The shape was sphere-like with colored lights circling it. (blue, red and yellow). It was hovering for about 20 minutes, then it started to move straight up slowly into the clouds. I ran upstairs to find my husband and he saw it too from our bedroom window. I asked him if weather balloons had lights he said he didn't think so and was blown away by what he had seen. "We are not alone". 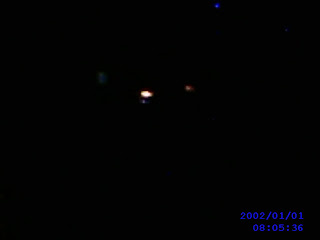 Date: June 14, 2007 Time: 2:00 a.m.
HBCC UFO Research will request the photos. 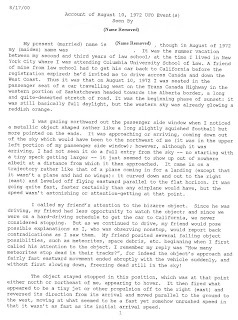 Location of Sighting: Brandon, Manitoba Number of witnesses: 1 Number of objects: 2 Shape of objects: Disk shaped. Full Description of event/sighting: Actually I snapped 9 pictures of these disks through my window. I could email them to you. It was about 2:00 a.m. and a clear night when I was looking out my window. I saw these yellow rays that looked like fire, they went out after about 10 minutes. I grabbed my camera and snapped a few pictures of them and I watched them for about an hour. Then they just flew away real fast. 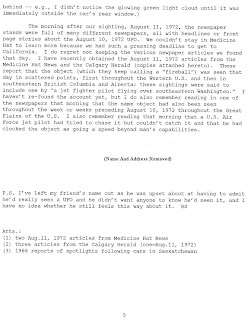 It was in the east end of Brandon Manitoba and also I heard the sound of jet engines a few times that night. 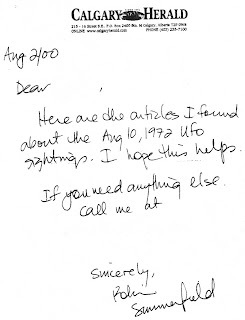 To email me, my address is: (removed by HBCC UFO Research). 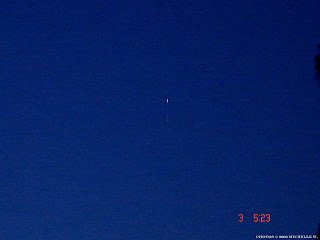 I saw these UFOs on early Thursday morning these pictures were taken at about 2:00 am in the east end of Brandon, Manitoba. You might have to clean the pictures up a bit with a program to enhance them and they were taken pointing the camera threw a window screen. Those 2 red dots to the left are a radio tower and those blue dots are dust on the lens. 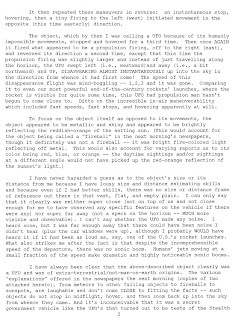 HBCC UFO Research Note: This sighting report I had posted back some years after I received the letter from the eyewitness, I thought it would be nice to post the actually letter the lady sent to me. 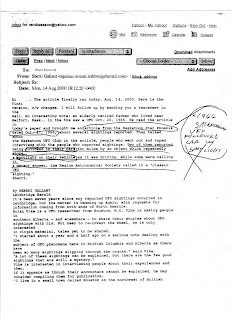 There are 9 images/letters below so you can read the witnesses letter to me. I have removed another ladies name. 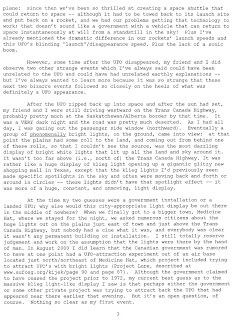 I just gave a short bit about what the letter holds, you can read about the entire sighting in at the links provided. My present (married) name is (name removed), though in August of 1972 my (maiden) name was (name removed). It was the summer vacation between my second and third years of law school; at the time I lived in New York City where I was attending Columbia University School of law. A friend of mine from law school had to get his car back to California before the registration expired; he'd invited me to drive across Canada and down the West Coast. 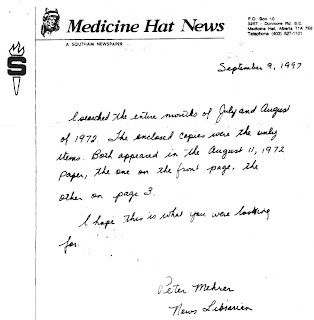 Thus it was that August 10, 1972 I was seated in the passenger seat of a car traveling west on the Trans Canada Highway in the western portion of Saskatchewan headed towards the Alberta border, a long and quite - deserted stretch of road. It was the beginning phase of sunset: it was still basically full daylight, but western sky was already glowing a reddish orange. Location of Sighting: Sackville, New Brunswick, Canada. Full Description of Event/Sighting: Three friends and I were walking trough the woods of our small rural town one day after school. We decided to go the gravel pit nearby and climb atop one of the huge mounds of gravel which could put us above the above the tree line for a good view. We were sitting atop the gravel pile just chatting and hanging out. As I was looking towards the horizon above the tree-line, I noticed a really big bright white star right on the horizon, or what I thought to be a star at first. Being quite familiar with the sky, this object looked out of place to me. No stars were at this position at this time of the day/month, at this brightness. I looked at it for about a minute, then I brought it to the attention of my 3 friends. Then it started moving up from the horizon bearing north east (to the right), held its position, retaining the same point like, star qualities. It then began moving west, to the left. 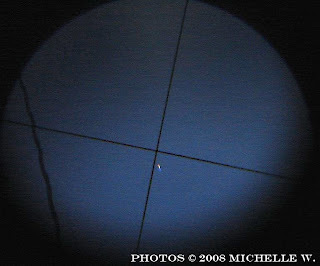 I remember thinking "heck, this isn't a star, but what kind of craft can do that sort of maneuver, planes and jets have to fly strait and can't stop"
Then it started getting bigger as if it were moving closer and we realized it was coming towards us. For lack of a better word, it "broke" into three lights (I believe the three lights, appeared blurred into one white light, because it as too far for our eyes, and upon coming closer we were able to view it correctly). The craft came directly at us and proceeded to move directly over top of us at an extremely low altitude, at a height I would roughly estimate to be a 100ft. There was no sound. Nothing, no combustion process whatsoever, no exhaust trail. Just what seemed like the sound of an object moving through the air, almost inaudible. It was completely black and I couldn't make out any surface features on the object, except for 3 lights, one on each corner. It slowly flew over and past us. Then it just proceeded to move out of sight at the same speed. I remember us being completely wild and distraught, stunned and bewildered at what we had seen. I think about this incident quite often, but only now felt compelled to say something about it. 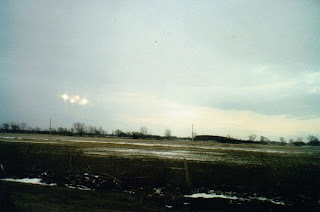 If anyone else see has seen such triangle craft in eastern Canada, I'd love to hear about it. Was this advanced military technology, or other-worldly?